Yep — we’re tackling that topic no one wants to talk about: Money and the Law of Attraction! You’ve heard about the Law of Attraction, right? Essentially it states that we draw into our experience that which we believe and accept for ourselves. What we focus on is what we attract. So you may be wondering why it doesn’t seem to be working for you … especially when it comes to money. Here’s a powerful truth: The Law of Attraction is true, regardless of whether you believe it or not. And the Law of Attraction is working all the time — whether you focus on positive or negative. So let’s put it to work intentionally, so we see the results we desire! Are you ready to experience incredible and amazing results? Let’s go! 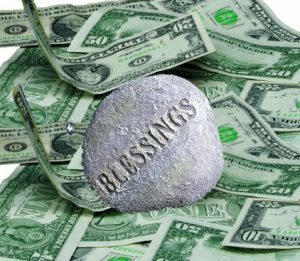 Whenever you receive money, take a moment to bless it; whenever you spend money, take a moment to bless the recipient, affirming your money is going out to do good and will return to you multiplied. #2: Keep track of exactly how you are currently spending your money. Write down every expenditure, without judgment or guilt. At the end of the week, evaluate your spending habits. Sometimes we spend money without realizing where it goes, and we end up using our resources for unimportant things. This shortchanges us when there is something we really want to do. #3: Use Prosperity Affirmations on a regular basis. For example: I have now transcended all patterns of lack. I am rich and prosperous. Money flows to me easily and effortlessly, and I have plenty to share and plenty to spare. I am one with the Divine Law of Abundance, and give and receive joyfully and generously, knowing there is always plenty. #6: Be grateful with everything you spend. When you write checks, we recommend that you physically write the word “Gladly” above the words “Pay to the order of …” When you pay bills on line, as you hit SEND, add a prayer of gratitude to the recipient and bless the transaction of energy. When you use cash, surround it with the energy of love. #7: Make a list of how you would spend a large amount of money. In order to attract large amounts of money, you need to be ready to accept it by right of Consciousness. This means you need to begin thinking in terms of large amounts of money, and feeling yourself having it. Think about what a large amount of money would be for you — then double it! Now make a list of exactly how you would spend it! Then be on the lookout for amazing things to happen. BONUS TIP: Give! That’s right! When we give, it is a powerful confirmation of our belief that we have plenty. So find a way to give to something that really matters to you. You can give money, time, resources, creativity — there are endless ways to give. Giving and Receiving are intertwined, creating a cycle of flow. Look for ways to give — and be ready to receive with gratitude and grace. and the money is lagging behind. I tried to use the power of attraction but find mysrlf hard to convince. With your help I will put this into practice once more. Thanks, Jacqueline! We affirm you experience an inner connection with the Field of Infinite Potential, and not only will money flow to you easily and effortlessly … you will also know the joy of inner peace as you live in alignment with your Divine Nature! Abundant Blessings! Keep us posted on your experiences! I have read these suggestions. I even printed them for quick resource when I am not near my computer. As you know, I am trying to get a new business going and these will definitely help me to stay in the right frame of mind. Thanks, Renée! We affirm your business success, and see you helping a lot of people with the special gifts you have! Good article thanks for sharing i am trying to get a new bracelet business off the ground to share my creative side and these suggestions wi help. Thanks, Beth! We affirm huge success with your business, seeing your passion drawing customers who love your product and value your creativity! !